I love finding fun ways to embed writing and reading into our day. 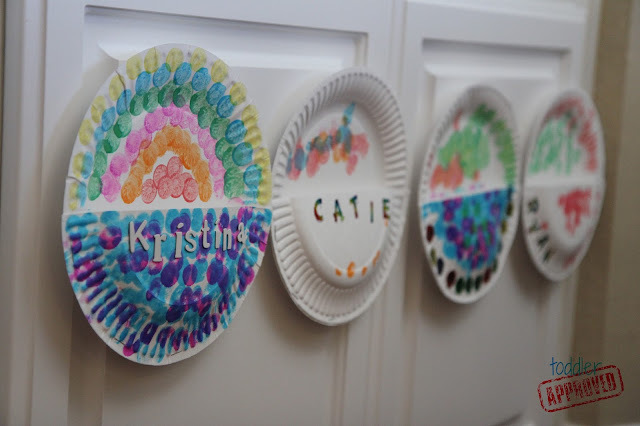 Last week we created some simple paper plate mailboxes for each member of our family so that we could write notes to one another. 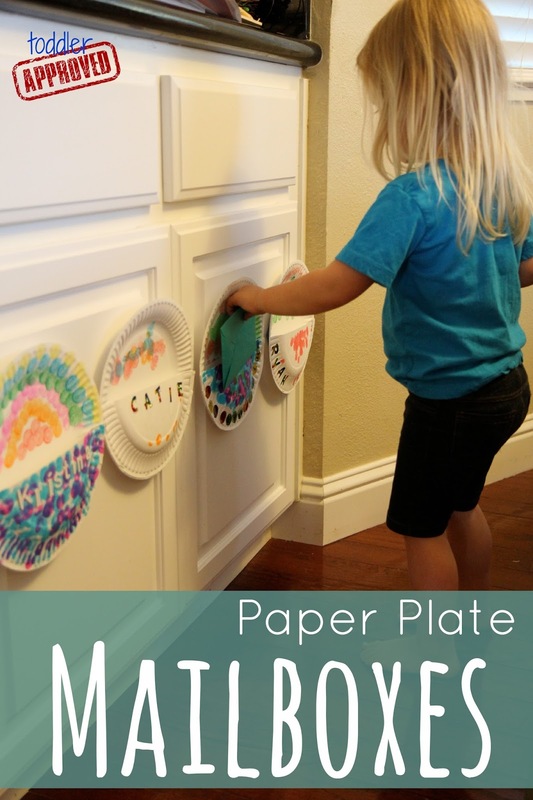 Making a paper plate mailbox is very simple. You only need two paper plates, scissors, and a stapler. The director at my son's preschool showed these to us last year and we made them for all the kids at his school for the post office pretend play area. I love them! You can use your favorite embellishments to make them personalized. We used do-a-dot markers, stickers, and crayons. To construct a mailbox we just cut one paper plate in half. Then we stapled the bottom half to a big paper plate. We made sure to keep the opening free from staples so that the kiddos could stick mail in their little mailboxes. Once we made a mailbox for each family member, then we decorated them, and then we hung them up in an easily accessible spot in our kitchen. I also put envelopes, writing materials, and blank paper close by the mailboxes so that the kids could write notes to family members whenever they wanted to. With my toddler we practiced making her name on her mailbox with stickers. I wrote her name with pencil and then she put matching stickers on top of the pencil letters. She loved practicing saying the letters in her name! Once her name was on her mailbox, she decorated it with markers. It has been fun to see how excited the kids are to write little letters or draw pictures for one another (and for me and my husband). Once the mailboxes are set up you can have the kids practice being mailmen/women and take the letters around to each family member! There are so many great learning skills embedded in this activity too! Recognizing words, names, writing letters/shapes/lines, working out fine motor skills by peeling stickers and putting paper in envelopes and into mailboxes, etc. 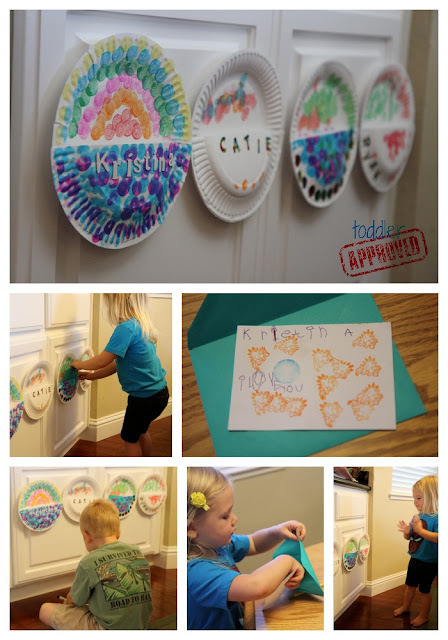 Have you ever made mailboxes with your kids or done post office pretend play? My girls are almost 10 and 12 and we are so doing this! I added another plate as a place to put pens and index cards to have very handy!! Love this! What a wonderful idea! It's creative and educational. The children can have fun with these while creating and after the too. Love it! oooh, definitely doing this with my 6 and 7 year old. They love making cards and having a good delivery system in place will only encourage them. It is such a sweet idea. This is a fabulous idea, Kristina! You've just inspired me! I have the perfect plan for some of these!